The BAF Bin Activator for Food Applications is the ideal choice in terms of quality, assurance and reliability for applications requiring safety and consistent material discharge. 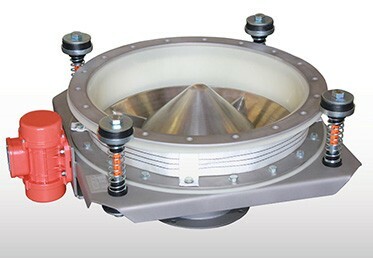 The BAF Bin Activator for Food Applications is a device of tapered conical shape that, due to vibration, facilitates material flow from hoppers or silos during discharge. Manufactured from stainless steel, the BAF Bin Activator line offers a high surface finishing grade. The mating parts are continuously welded on both sides, deburred and smoothened on the edges, niches, cracks, and crevices, thus obtaining a perfectly smooth surface. As a result, material residue is reduced to the minimum. BAF Bin Activators consist of a seamless 304L or 316L stainless steel cone manufactured on a sheet metal lathe, a seamless gasket with integrated upper and lower flanges manufactured from food-grade SINTAL engineering polymer, suspensions connecting the Activator with the silo cone, as well as one or two electric motovibrators by OLI.